World War II veterans Jack Kreider, left, and Joe Coserta shared the honor of laying the wreath. Memorial Day is a particularly sad time for Joe Coserta, a 95-year-old World War II veteran who fought in Europe while serving as a tank commander with the U.S. Army’s 3rd Armored Division. 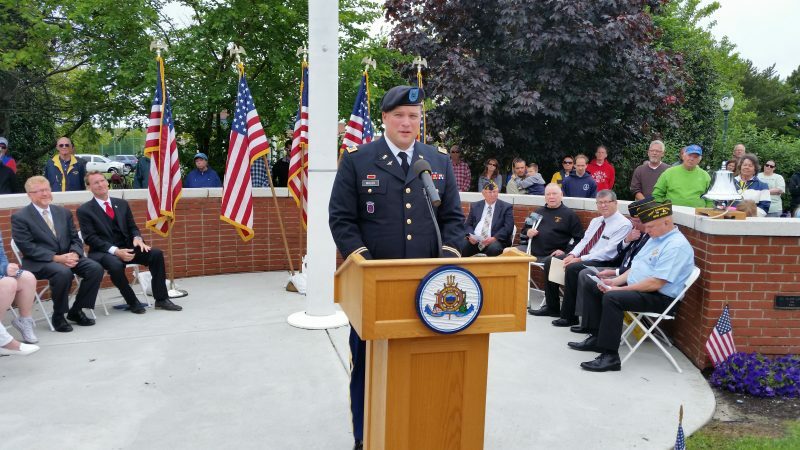 Coserta, who has lived in Ocean City for 30 years, explained that Memorial Day ceremonies remind him of his fellow soldiers who were killed on the battlefield more than 70 years ago. 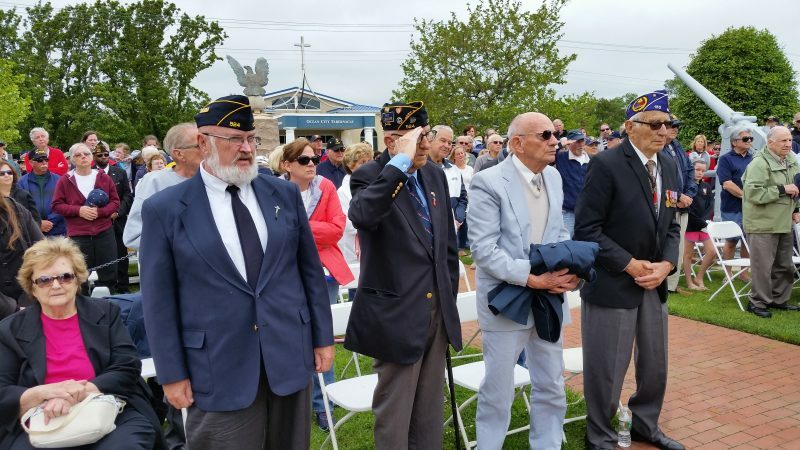 Hundreds of people filled Ocean City’s Veterans Memorial Park on Monday for a somber Memorial Day service that showed that they, too, haven’t forgotten the military men and women who lost their lives while serving their country during different wars. The ceremony drew hundreds of people to Veterans Memorial Park. 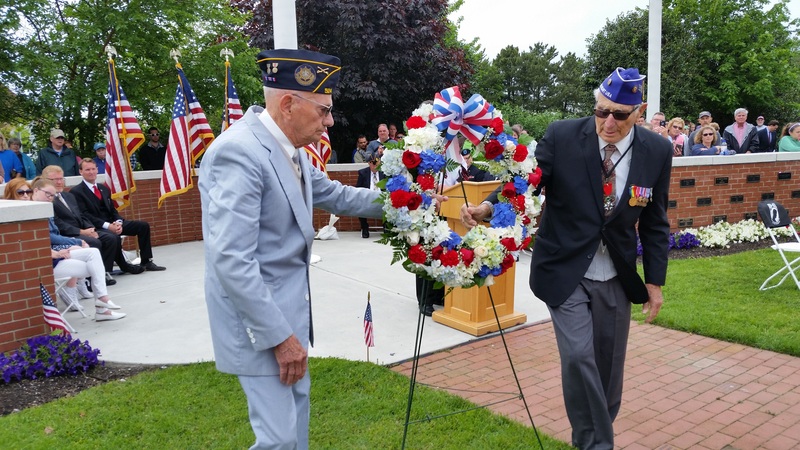 One of the most poignant moments of the ceremony came when Coserta and fellow World War II veteran Jack Kreider laid a wreath to remember the dead. Standing together, Coserta and Kreider saluted the wreath, a gesture that brought tears to some of the people in the crowd. “I was very proud to help – honored, actually,” Kreider said of his participation in the wreath-laying. Kreider, 92, who has lived in Ocean City since 1986, was stationed in Europe and served as an Army radio operator in an armored car during the war. Kreider said he looks forward to Memorial Day ceremonies each year because they bring the community together for a noble cause. “Just the fact that so many people assemble on this day is something that is deeply appreciated by all of us who have served in the military,” he said. 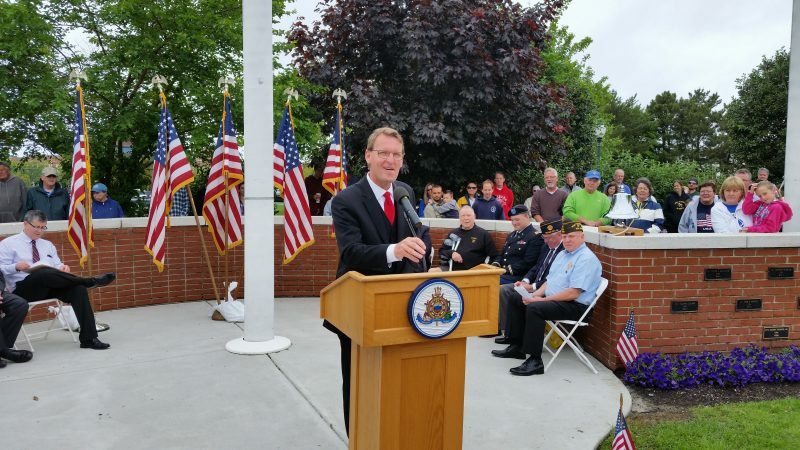 Mayor Jay Gillian, in remarks during the ceremony, paid tribute to the veterans who have connections to Ocean City. 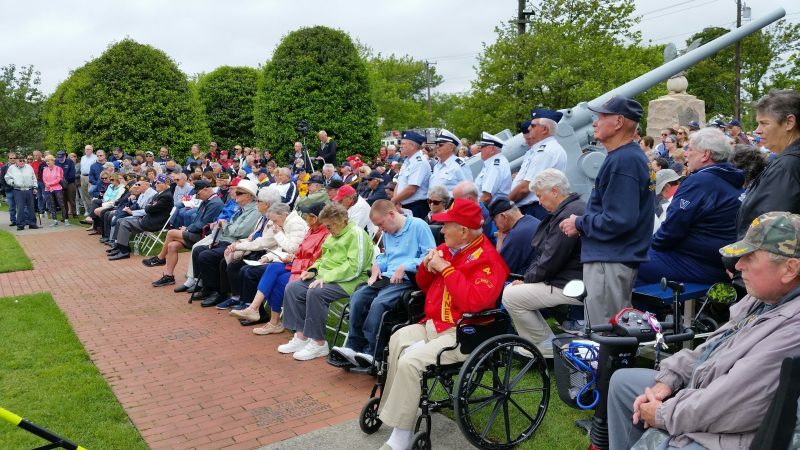 “Ocean City residents have always answered the call to duty,” Gillian said, noting that a memorial wall in Veterans Memorial Park lists the names of the city’s hometown heroes. Mayor Jay Gillian paid tribute to all members of the military from Ocean City. The mayor also recognized the contributions of the local veterans organizations, including American Legion Post 524 and VFW Post 6650. “Ocean City has always respected the men and women of our military,” Gillian said. Michael Morrissey, commander of VFW Post 6650, led the crowd in reciting the Pledge of Allegiance. Jim Sambucci, of American Legion Post 524, and Clark Manley, of VFW Post 6650, read the names of veterans who are enshrined in Ocean City’s Honor Roll. While delivering the Memorial Day invocation, the Rev. John S. Sheldon, of the First Presbyterian Church, stressed that many Americans have made the ultimate sacrifice while protecting the country’s basic liberties. “Many boys and young men gave up two lives – the lives they were living and the lives they would have lived,” Sheldon said, recalling a quote from President Ronald Reagan. The ceremony’s keynote speaker was Ocean City native Luke Anthony Walsh, a decorated Army Blackhawk helicopter pilot who flew 90 missions in Afghanistan. Walsh challenged the crowd to spend some time at their local American Legion or VFW posts. He said that would give them an opportunity to learn about the sacrifices that have been made by so many American veterans and to gain a better appreciation of wartime history. “Remember that the fallen are more than numbers on a page,” Walsh said. Keynote speaker Luke Anthony Walsh urged the crowd to visit a local American Legion or VFW post to learn about the sacrifices made by veterans. Conspicuously placed at the front of the Memorial Day ceremony was a small table, draped with a simple white tablecloth and adorned with a red rose. A glass was placed upside down on the table and there was a solitary, empty chair. Steeped in symbolism, the table and other items represented the soldiers who were taken prisoner or went missing in action and never returned home from war. Jack Hagan, adjutant of American Legion Post 524, explained that the white tablecloth symbolized the purity of the soldiers and the red rose represented the blood they may have spilled. The glass was turned upside down because there was no opportunity for those soldiers to enjoy a celebratory post-war toast. The chair remains empty because the soldiers are still missing. But a white candle was also placed on the table, symbolizing the hope that all of the missing soldiers will someday return home.